Whilst buildings are now made more airtight than ever before, this consequently results in lower ventilation. Mechanical Ventilation Heat Recovery System employs a cross flow or counter-flow heat exchanger between the inbound and outbound air flow providing fresh air and improved climate control. The (warm) stale air from the wet rooms and the (cold) fresh air from the exterior both pass through a heat exchanger, in opposite directions and without mixing. The heat contained within the extract air is transferred to the incoming fresh air, which is then introduced back into the living areas of the building. Heat Recovery Ventilation Systems do not produce heat, but minimise the amount of heat which would otherwise be lost through ventilation, with degrees of efficiency varying between 90 – 95%. In doing so, it reduces the amount of heat that needs to be produced to keep a house warm. When at the early stages of designing your new build or property refurbishment, we at Earth Save Products will design a system which is unique to your project. We picked up three awards for our contribution towards energy efficiency and renewable technologies. I recently had an ESP ASHP installed for our underfloor heating and MVHR system installed. The team worked to budget and delivered it on time. I would just like to say that ESP are a very professional team to deal with. Worthy winners of two national awards. We are delighted with out ESP system. We noticed our energy bills drop immediately and our home has never felt so cosy. With over 15 years delivering energy saving solutions we take pride in the expertise and knowledge we have developed. We know that our products are delivering savings to thousands of happy customers and we can guarantee there is no one better than us than installing the range Earth Save Products. As the designer and manufacturer of our product range we have a complete understanding of the products capabilities. So when you choose us to install your system you can have the peace or mind that the end results will be of the highest standard. We can also help you when claiming grant assistance, RHI payments and assist with Heat Loss Calculations and Audio Calculations required by building regulations. Our in-house experts are always available to provide free advice and assistance – whether your question is technical or relates to the funding that is available to support the installation of our systems, all you need do is call us or mail us and we will help you. Multi-award winning Ecocent system recovers heat from used air and provides hot water at 60°C. You can now heat your property efficiently with an Earth Save Products underfloor heating system. Our range of Air Source Heat Pumps deliver low cost heating solutions and reduced energy bills. Air ventilation normally leads to loss of heat in a property. Our MVHR system recovers heat in your property. 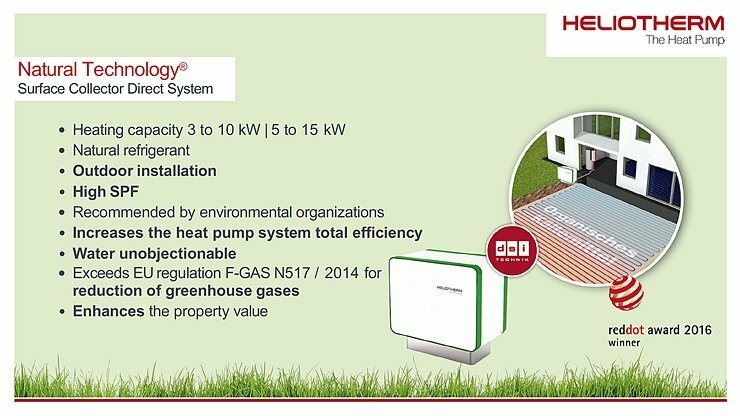 As this ESP #Heliotherm #GroundSourceHeatpump is installed outside it increases the amount of usable living area. This heat pump is harmless as far as water safety is concerned and can even be registered within a water protection area.